SAN DIEGO (Monday, October 22, 2018 – #18-18) – The 14-time champion San Diego Sockers have signed free agent midfielder Travis Pittman to a one-year contract for the 2018-19 Major Arena Soccer League (MASL) season. As per team policy, terms of the contract will not be disclosed. The Manassas, Virginia native won a MASL championship with the Baltimore Blast in the 2016-17 season. Pittman has scored 28 goals and recorded 23 assists in his 47-game arena soccer career. He played two seasons with the Wichita B52s (2013 & 2014) and had a short stint with the Missouri Comets in 2015. He most recently played with the New York Cosmos B team of the outdoor National Premier Soccer League (NPSL), winning a title in 2015. Pittman’s outdoor resume includes being a four-year starter at West Virginia University, playing for the United Soccer League’s Richmond Kickers in 2016 and FC Wichita of the NPSL in 2017. As a youth player, he competed with the United States Youth National Teams at the U-14, U-16, and U-18 levels. ABOUT THE SAN DIEGO SOCKERS: The 14-time champions are celebrating our 40th anniversary and are proud members of the Major Arena Soccer League, a 16-team nationwide league. We are committed to having a Culture that works with our supporters and partners, a Club that will be competitive on the field and good citizens off, and will actively be involved in philanthropy and events that benefit our Community. The 24-game 2018-19 season kicks off in December 16 at Valley View Casino Center. 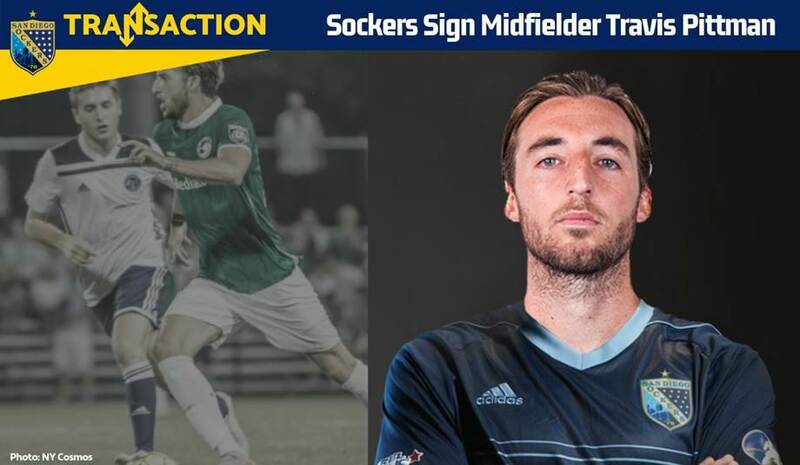 For more information, visit Sockers.com.